Warner Bros.' had a magic weekend with their $263 million global launch of Fantastic Beasts: The Crimes of Grindelwald. Eddie Redmayne returns as Newt Scamander in this follow-up to the 2016 expansion of the Harry Potter universe, Fantastic Beasts and Where to Find Them. This time he faces off against another powerful and dangerous wizard bent on opening an all-out war against humanity and establishing pure-blooded witches and wizards’ rulers of the wider non-magical world. Johnny Depp plays Gellert Grindelwald, the evil wizard who gives the film its title. Joining them in this installment are Jude Law in the role of a young Albus Dumbledore, an ally of Scaramander's in his fight against Grindelwald. Zoe Kravitz plays Leta Lestrange, an old love interest who still holds a powerful sway over the film's hero, even though she is engaged to his brother, a wizard named Theseus played by Callum Turner. Crimes of Grindelwald took $62 million in its US debut but made up for that with strong showings overseas. It made $16.3 million in the UK, $12.8 million in Germany, and $12.1 million in Russia. In France, where part of the film was shot, it took $11.7 million. China's opening was soured by a strong second showing for Sony's Venom, which took $51.2 million and left Grindelwald with $37.2 million and a second place opening for this weekend's biggest global newcomer. While Warner's would have wanted to get a good deal more from their big domestic launch this frame, they did manage to freeze out competition from Paramount's Instant Family, leaving them with just $14.5 million and a fourth-place debut. Mark Wahlberg, who also served as a producer, stars as Peter Wagner. When he and his wife Ellie, played by Rose Byrne, decide to adopt they had one kid in mind but end up taking in three when the girl they've been matched with insists she won't leave the orphanage without her two younger siblings. Octavia Spencer and Tig Notaro play skeptical social workers who try to help the new parents of three, while Isabela Moner, Gustavo Quiroz, and Julianna Gamiz play the three new members of the Wagner family. Reviews have been generally strong, but it looks like their target demographics overlapped with Grindelwald in too many sectors to have its launch work as counter-programming. Foreign releases start next week in Mexico and continue into mid-March. In holdover news, Venom hit $780.5 million in global grosses with its second killer China showing. It's now sixth in global sales this year and will pass up Mission Impossible: Fallout's $790 million early this week to move up a rung. Bohemian Rhapsody meanwhile added $45.5 million and took its global tally to $384 million, overtaking this year's other big music film A Star is Born's $340.7 million cume. 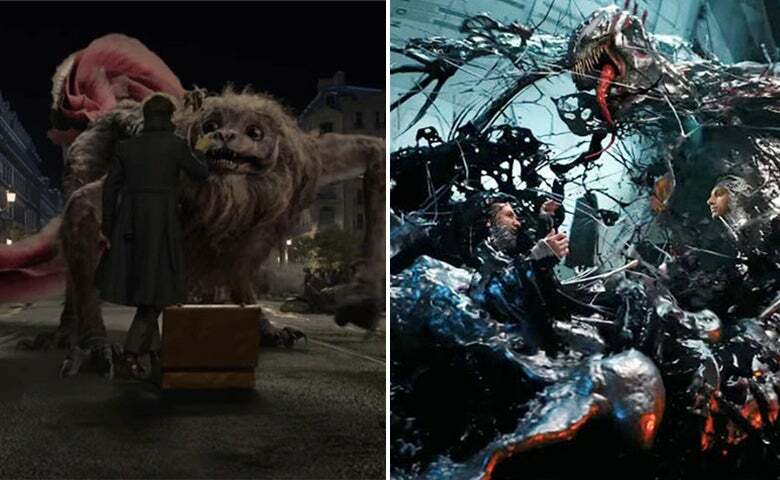 The Grinch hit $151.7 million worldwide, while The Nutcracker and the Four Realms failed to make up ground and sits at just $116.3 million from three frames. Thanksgiving comes early this year on the 22nd and this weekend's Holiday frame will give us a packed slate with US launches of Ralph Breaks the Internet, Creed II, Robin Hood and more limited releases of Green Book, and The Favuorite capping off this weekend's cinematic feast.